You don’t have to travel far off the “lucky country’s” beaten track to find frontier Australia. The Hume Highway, the nation’s busiest road connecting Melbourne and Sydney, drives through a heartland flush with gold rush history, bushranger legends and folklore. Sleepy towns with big pasts punctuate the route, availing the curious traveller with pit stop narratives on nationhood. An hour northeast of Melbourne is “Kelly Country.” The landscape is littered with the memory of highwayman Ned Kelly. 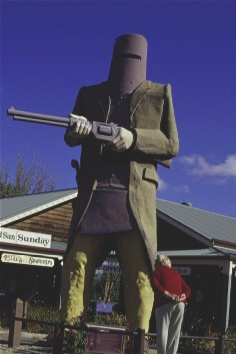 I make for Glenrowan, the site of Kelly’s last stand. Through child’s eyes, I once imagined the “iron outlaw” in his plough-steel letterbox helmet as a primitive robot or some ghost in the machine of 19th Century agricultural engineering. A rifle-wielding statue of Kelly in his trademark chest plate and headdress towers over the town’s post office. The town that betrayed him now trades on his name. There’s Kelly Gang wines, Kelly Bakehouse and, at the Kelly Memorial in Kate’s Cottage, I walk through a replica of the dirt floor Kelly family shack. Masked Kelly’s are festooned on everything from belt buckles to stubby holders. A wooden effigy on Siege Street, looking more like South Park’s Kenny, marks the spot where, in 1880, they killed Kelly!? ?Descending the long blue gum straights into King’s Valley, mist lightly touches the vines of one of the country’s oldest wineries in the gourmet village of Milawa – a culinary crossroads between the Hume and the Snowy Mountain ski fields. After sating myself on what Ernie Menichelle at Browns Brothers flagship vineyard calls “the big, the bold and the beautiful, Durif,” followed by a bout of gourmet feta tasting at the Milawa cheese factory, I decide to skip the Hume and take the slow road out of Victoria. Horse limbed trees and rickety fence lines trace the windy ascent to the once gold rich Beechworth. Even on a busy tourist weekend there’s an air of tranquility about the postcard perfect Victorian main street. An aroma of coffee lingers on the breeze. It wasn’t such a benign venue for the Kelly family. Ned’s outlaw mentor Harry Power, was tried here, and both Ned and his mother were locked up in the prison. Kelly’s death sentence was passed down at the courthouse. 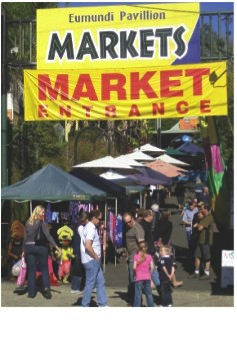 Next stop: Gundagai NSW, on the banks of the Murrumbidgee River. There aren’t too many towns featured in song like Gundagai. Fewer still can lay claim to an anthem based on a piece of bush prose about a down-on- his-luck ‘bullocky’ whose ‘dog sat on the tuckerbox’. The highway sign announces: “You’ve heard the song now be part of it.” I’m not sure I’d want to be. The 921m long Prince Alfred Bridge, one of over 300 heritage sites in the county, was built after flood destroyed the settlement in 1852. Before that, ‘bullockies’ driving ox drawn carts pulled up to pubs on either side of the river here, trading yarns and verse while awaiting punts. Even Banjo Waltzing Matilda” Paterson penned a ballad called ‘The Road to Gundagai’. ? ?The only definable songs I hear are the caws from flocks of Currawongs and choruses of hooting rugby league fans in the public bars. “This is league country,” announces Brian Tozer of Lanigan Abbey Estate Art Gallery, “but the streets take the names of poets.” There’s Sheridan, Byron, Homer, not to mention Otway who also lends his handle to the landlocked submarine beached in a park down the Hume at Holbrook. Tozer insists I’ll get a better feel for the place at the Family Hotel. In the space of five minutes, I encounter “Scoop” the local newspaper editor, a detective and the mayor, all three whistles decidedly wetter than the NRL ref overseeing the gladiators on the big screen. “Bushrangers?” Pipes Steve the cop, “they were nothing but thugs, not heroes.” On the face of it, I guess he’s right, but in the 19th Century the thin blue line of authority was as murky as the Murrumbidgee in high water. Territory beyond the Great Dividing Range was only settled after “currency lad” (native-born) Hamilton Hume and his aloof English counterpart Hovell, set out for fresh pastures in 1824. Rapacious empire builders, crooked constabulary, avaricious free-settler squatters and convict settlers simmered in a social pressure cooker that boiled over during the 1850’s goldrush. Gundagai’s own celebrity highwayman, Captain Moonlite, started life teaching a church school in the Coromandel and served in the Waikato Militia during the 1860’s, before crossing the ditch to embark on his less righteous career.? ?After paying homage to the dog-on-the-tuckerbox sculpture at Snake Gully, Banjo Patterson at Poets Park, and the grave and homestead of Hamilton Hume in Yass, it’s the 15-metre high Merino named “Rambo” – the L&P bottle of the wool producing Southern Tablelands – that signals Goulburn. I have an appointment with a man dubbed by some as the “mad monk.” If madness equals passion, then Father Michael O’Halloran at the Goulburn Brewery, the oldest operational brewery and maltings house in Australia, is quietly round-the-twist. “Remember,” says O’Halloran with a twinkle in his eye “You’re on hallowed ground now. A 50 kilometre stretch of dirt road separates the serene backwater of Tuena from big brother Crookwell; both a safe distance from the 21st Century. During the 1850’s, a 10,000 strong population worked Tuena’s gold-rich waterholes. Today locals number between 30 and 40, depending on who’s home. At the Parson family’s General Store, I stumble on a tenth of the town’s population having a celebratory coffee in honour of the “centre of the community,” shopkeeper Jenelle, who has just received word of the birth of her Great Grand Daughter. The shop has been in Bryce’s family since 1870. Somehow he’s related to one of the Barb’s, or was it Joy and Dianne? All regale me with their compendiums of family history. Life here is measured and void of pretences. There are no tourist “attractions”, just a sense of the past, a few wattle and daub relics like The Goldfields Inn (1866,) the oldest hotel of it’s kind in Australia. The Hume Highway is one of Australia’s most important and notable interstate highways, running some 900km inland between sydney and melbourne. It is a vital link for road freight to transport goods to and from the two cities, as well as serving albury, wodonga and Canberra. The speed limit along the majority of the Highway is 100 or 110km/h, with a reduced speed of 50km/h where towns are not bypassed. Ned Kelly’s World and Kelly Country Tourism: www.nedkellysworld.com.au?